Lord of the Fries was born out of a love story between the original founders Mark and Mandy’s love of both fries (and each other), a story that started in Taiwan in 2004 that over time has gained a cult following through hitting the streets and festival scene to today, with 13 dine-in or take away locations across 4 states. The size and popularity has not been the only thing to grow. 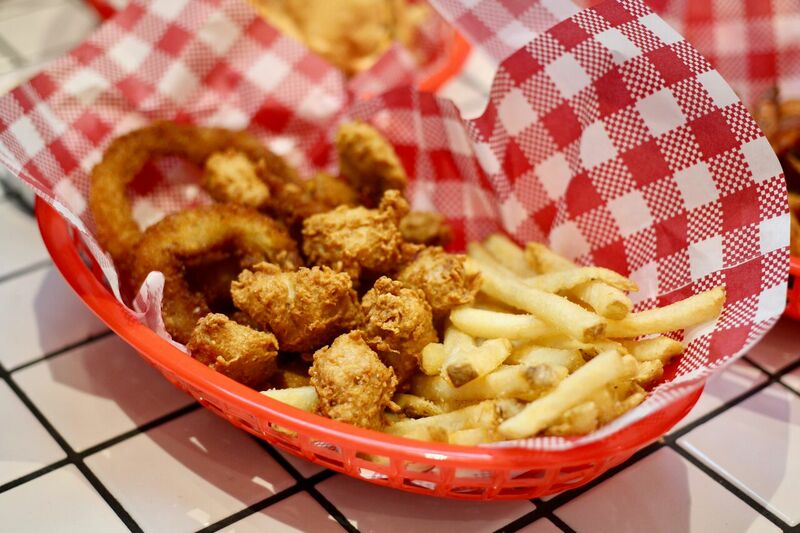 Having started with specialising in fries to expanding to anything from nuggets, hot dogs, onion rings and burgers. 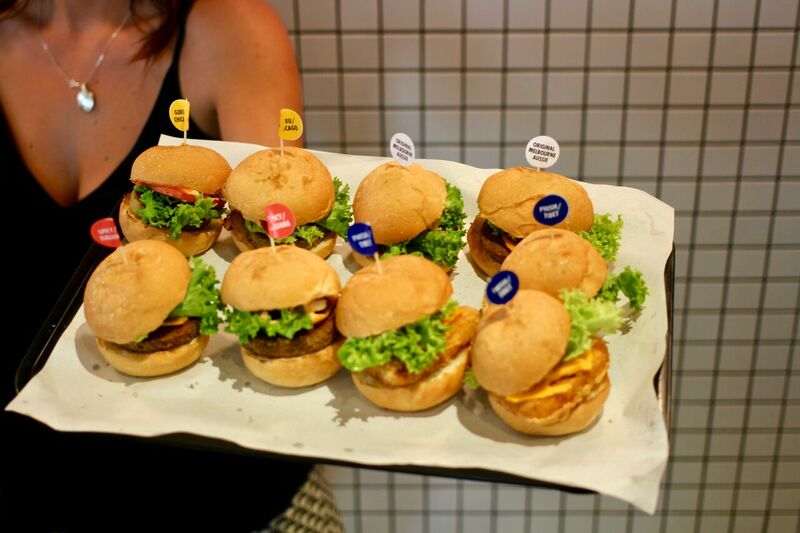 It’s fast food but ethical, vegetarian and award winning and Adelaide is excited to have them here. Stepping through the door of the Hindley Street enterance takes you back to the old 60’s diner style setting. With white tiles lining the floors, walls and table tops and a dash of red and black to fit with the Lord of the Fries aesthetic. In the far corner you’ll find the sales counter and kitchen beyond, all shiny polished silver as far as the eye can see. On the menu for the lucky guests tonight was a selection of 4 of their burgers, fries, onion rings, nuggets and a chocolate treat to end the night. Served in Lord of the Fries’ mini style burgers we were treated to the Original, the Spicy, the New Guru and the Phish. All 100% vegan but not at all lacking in flavour. From the classic burger taste of the Original, the kick of the Jalapeños in the Spicy, the crunch of the pickles in the New Guru or the slightly more fishy taste and tartare sauce of the Phish there without a doubt is a burger here that will cater to anyone’s taste or cravings. Fries are obviously the signature dish here, it’s how they have grown into the behemoth they are today and they approach their fries with a “go hard or go home” kind of attitude. 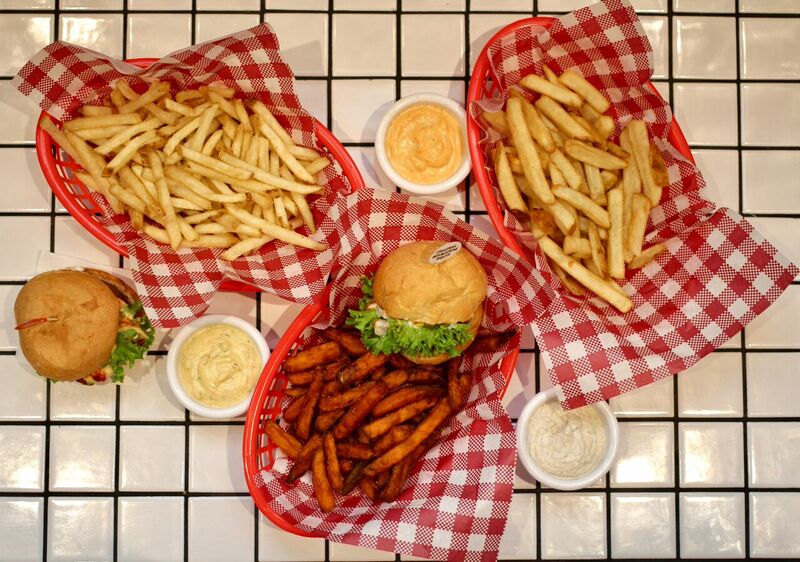 From as thin as their Shoestring fries to as thick as their Chunky fries with the Classic and Sweet Potato fries to add some variation we were once again spoiled for choice when there really was no wrong choice to start with. All lightly fried till golden with a light sprinkling of salt every handful is delicious whether you chose to dip it in the spicy mango chutney Indian, the spicy chilli mayo Vietnamese or aioli garlic mayo Parisian sauce. Snacks are an important part of getting most people through any day of the week and to have been introduced tonight to soy bean Nuggets that are so crispy but also juicy on the inside with a hint of salt I have been questioning why I have eaten any other type of nugget ever before and will most likely continue to do so for a few more days. Onion Rings much the same are more generously battered and fried but also so deliciously crispy on the outside it’s a joy to bite in and taste the sweet caramelisation of the onion within. 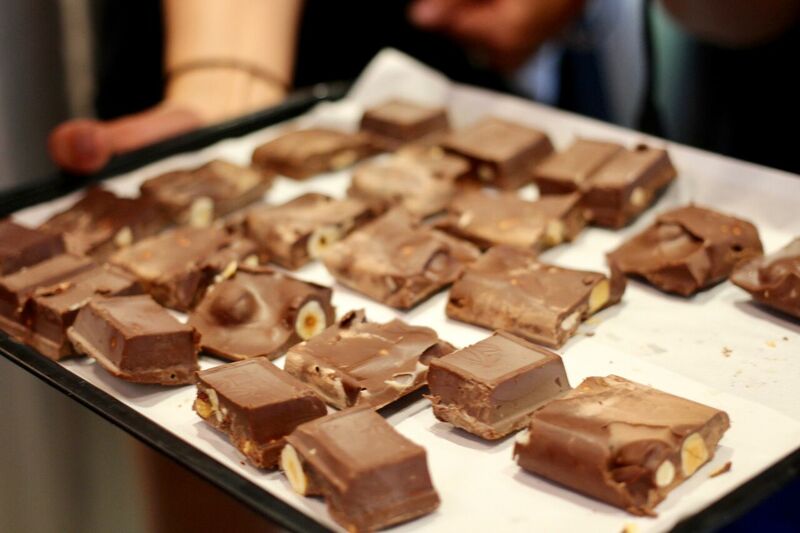 At the end of the night as the conversation surrounding began to dwindle we grabbed our square of vegan hazelnut chocolate as we headed towards the door knowing that the oil used to cook tonight’s spread of food would be repurposed to fuel their oil delivery trucks. Adelaide Food Central would like to thank Mandy, Jay, his wife and the team at Lord of the Fries as well as Mikahla and Laura from Mkt. Communications for the invite to such a wonderful and special evening. We here wish you all the best and can’t wait to visit again soon. 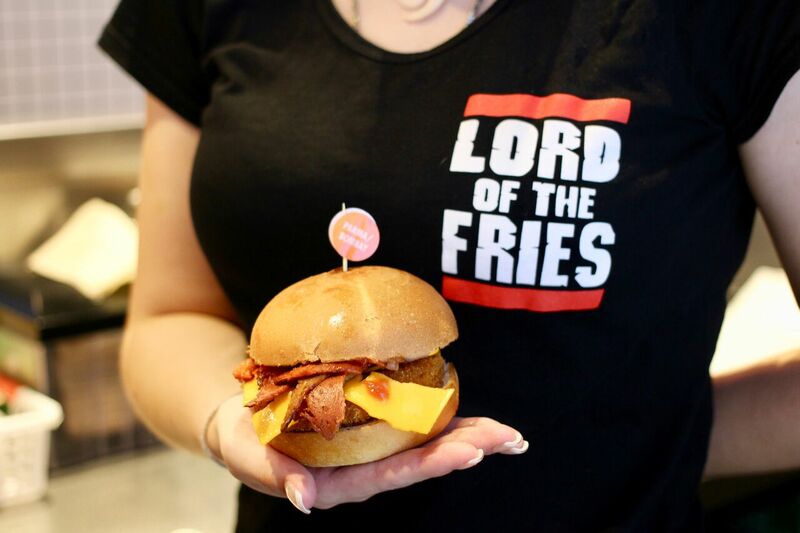 Lord of the Fries Adelaide is located at 23A Hindley Street, Adelaide, South Australia, 5000 and will be open 7 days a week and late on weekends.